Ralf Alastair John Little (born 8 February 1980) is an English actor, writer and semi-professional footballer, working mainly in television comedy. He has played Antony Royle in The Royle Family and Jonny Keogh in the first six series of Two Pints of Lager and a Packet of Crisps. Little was born in Oldham and attended Bolton School (Boys' Division) and his parents work as accountants. Some of his early television roles included minor roles in various programmes such as Elidor, Children's Ward and Sloggers. Little's break came when he was offered the role of Antony Royle in the BBC sitcom, The Royle Family. This prompted him to abandon his medical studies at the University of Manchester and concentrate on his acting career. The original run of the series was from autumn 1998 to December 2000, and after a one-off special in 2006 returned for a series of Christmas specials from 2008 to 2012, with Little returning to the role of Antony in 2006, 2009 and 2010. After the original run of The Royle Family, he was cast in another sitcom, Two Pints of Lager and a Packet of Crisps (or Two Pints), as Jonny Keogh. The first series ran from February 2001, and the programme ran for nine series in total. During an interview for This Morning in September 2007 Little said that he would not be returning for the next series due to an overwhelming schedule. His character was subsequently killed off. In 1999 Little played the Star of Bethlehem in the ITV comedy drama The Flint Street Nativity. In December 2000, Little played Wishee Washee in the ITV Panto Aladdin, which was filmed in the New Wimbledon Theatre. In 2001, he played the young George Harrison in Presence at the Royal Court Theatre, for which he was nominated for an Olivier Award for his performance. In 2004, he played the title character in Billy Liar at the Theatre Royal in Windsor. He appeared in Juliet McKoen's 2005 ghost story/murder mystery film Frozen, set in Fleetwood, Lancashire. Between November 2002 and January 2003 He hosted three one-hour-long episodes of the Ralf Little Show on BBC3. Other film credits include 24 Hour Party People (playing Joy Division and New Order bass player Peter Hook) and Al's Lads. Little also starred as Stephen, alongside Anne-Marie Duff, in Roger Goldby's film, The Waiting Room, released throughout the UK in June 2008. In television, he also appeared in Paradise Heights. In August 2007 he released his first online novel (co-written with Stephen Morris), The Golden Generation, a coming of age tale about a recently single man who is taken under the wings of two city traders who show him the trappings of big money in the big city but that it comes at a price. Money taken from the sale of the novel went to the charity Shelter. He was a cast member of KateModern, a web series which developed by the creators of the US YouTube hit lonelygirl15, which started in July 2007 and posted its final video in June 2008. In July 2008 he appeared in 50 Ways To Leave Your Lover, a new play at the Bush Theatre which was revised as 50 Ways To Leave Your Lover at Christmas later that year, while in September of the same year he starred in Massive, a BBC comedy about an indie record label. In 2008, he narrated the second series of Last Man Standing. Also in 2008, Little became the narrator of Monkey Life. In 2009, he played Clint in Married Single Other, alongside Miranda Raison He also worked on the film Powder. In the autumn of 2010, he starred in The Aliens, a British premier of a new play by Annie Baker, again at the Bush Theatre. In 2011, he appeared as Richard Dickens in the comedy series The Café, shown on Sky 1, which he co-wrote with Michelle Terry and which was directed by Craig Cash. In 2013, he appeared in Death in Paradise series two, episode six. As of April 2013, he was appearing at the Liverpool Playhouse as the father of a girl with cerebral palsy, in a new production of A Day in the Death of Joe Egg. In 2014, he appeared in the TV series Our Zoo. He also voices Captain Skip in the animated English version of The Unbeatables. He appeared as the character 'Steadfast' in "Smile", the second episode of the 10th series of the BBC1 series Doctor Who in 2017. In August 2018 Ralf starred as "Alan" in God of Carnage at the Theatre Royal, Bath. Little, a supporter of Manchester United, is a keen footballer and has played for a number of semi-professional clubs when other commitments allow. In March 2003 he played for Maidstone United against Wimbledon, having previously been training with Staines Town. He joined Isthmian League side Edgware Town in October 2004, making his debut in the FA Vase game against Waltham Abbey. He played for Chertsey Town during the 2007–08 season and on 8 July 2008 signed for North West Counties League side Stone Dominoes. He has also played celebrity football matches for charity on a few occasions and played with members of Hollywood United while in the district for acting career purposes. He also plays for the Arsenal Ex-Pro and Celebrity XI. On 6 June 2010, he participated in a Soccer Aid game for England on the left wing. On 9 August 2011, he played in the John Kennedy testimonial match for Manchester United against Celtic which resulted in a 5–2 win for Celtic. In May 2012, he appeared for the Sealand national football team in a match against the Chagos Islands as captain. The match was held at the grounds of Godalming Town. In August 2012 and March 2013 he played in two games against Alderney, a 1–1 draw and 2–1 win respectively. ^ "FACE OF THE DAY: Ralph Little; Nice work if you can get it". Herald Scotland. 31 August 2001. Retrieved 17 August 2014. 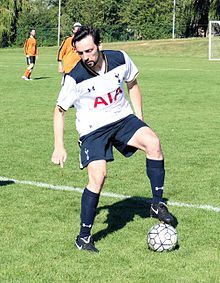 ^ a b c d "Ralf Little profile". BBC Comedy. Retrieved 8 August 2009. ^ a b "Ralf Little interview". BBC Berkshire. 13 May 2004. Retrieved 8 January 2009. ^ "The Waiting Room (2007)". IMDB. Retrieved 8 January 2009. ^ "Ralf Little Interview". BBC Nottingham. 3 July 2002. Retrieved 8 January 2009. ^ The Golden Generation profile; thegoldengeneration.co.uk; accessed 18 August 2014. ^ French, Dan (14 April 2009). "Ralf Little for 'Married, Single, Other'". Digital Spy. Retrieved 14 April 2009. ^ Cooper, Sarah (17 August 2009). "Red Union's Powder kicks off shoot this weekend at V Festival". Screendaily.com. Retrieved 8 June 2014. ^ Hitchings, Henry (21 September 2010). "Ralf Little and Mackenzie Crook take hazy break in stoned silence in The Aliens". The London Evening Standard. Archived from the original on 5 May 2013. Retrieved 22 September 2010. ^ Staff (9 April 2013). "Ralf Little stars in new play". Itv.com. Retrieved 8 June 2014. ^ "What's On: Music, Film, & Things To Do in Liverpool". Liverpooldailypost.co.uk. Archived from the original on 2 June 2013. Retrieved 8 June 2014. ^ "Royle family star plays for Stones". NonLeagueDaily. 29 July 2003. Archived from the original on 3 February 2009. Retrieved 8 January 2009. ^ "Painful start for Little". NonLeagueDaily. 29 October 2004. Archived from the original on 3 February 2009. Retrieved 8 January 2009. ^ "Actor Little joins Stone Dominoes". BBC Sport. 8 July 2008. Retrieved 8 January 2009. ^ "Ganet makes Berko switch". NonLeagueDaily. 2 May 2005. Archived from the original on 3 February 2009. Retrieved 8 January 2009. ^ "Stars on show at Aldershot". NonleagueDaily. 5 April 2006. Archived from the original on 3 February 2009. Retrieved 8 January 2009. ^ "Rayners Lane appoint 'celebrity' coach". NonLeagueDaily. 12 September 2005. Archived from the original on 3 February 2009. Retrieved 8 January 2009. ^ "Celtic Legends 5 Manchester United Legends 2: Henrik Larsson rolls back the years for charity". Daily Mail Online. 10 August 2011. Retrieved 1 April 2013. ^ Staff (7 May 2012). "Ralf Little gets an international cap for Sealand". Bbc.co.uk. Retrieved 8 June 2014.